1. 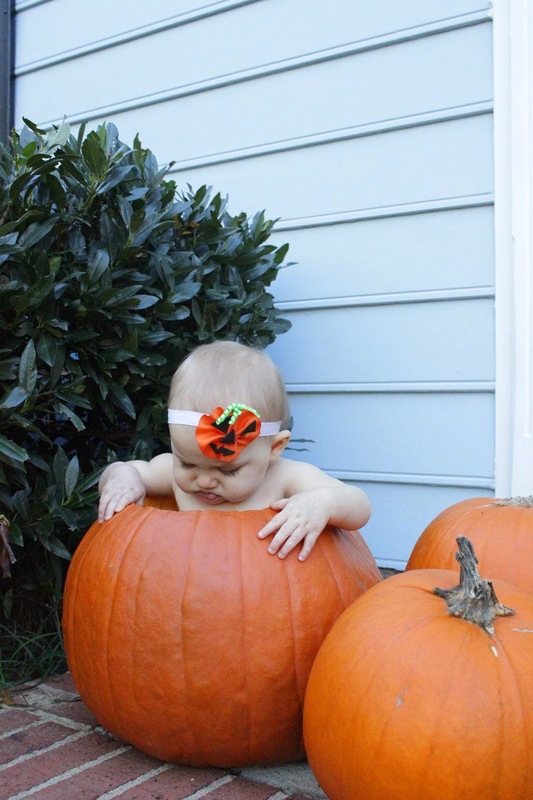 Ella in a pumpkin. Standard. You knew this was happening. Poor girl got eaten alive by mosquitos while I was snapping these pics! Her dad was not very happy with me once we discovered all of her bug bites! 2. The photo shoots didn't stop there...oh no. We had to take a few pics in our basket (that I also used at Easter) with all of the Halloween candy we had bought for me to eat the trick-or-treaters! Ella definitely had more interest in eating the card than taking a picture with it. 4. 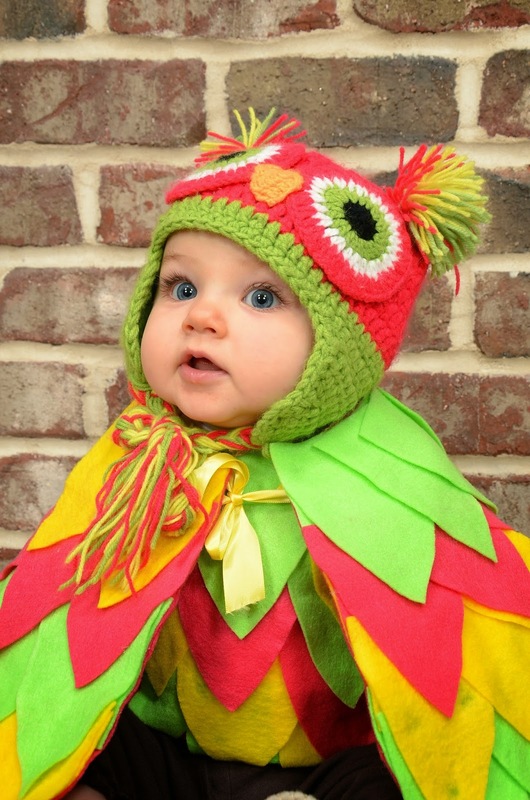 After her nap, Ella is going trick-or-treating at Daddy's office in her owl costume!!! Yes, I made it myself. My mom always made our costumes growing up, and I wanted to keep the tradition going. Well, maybe just this year since I am not working and it did not require any sewing (I can't sew). I somewhat followed directions from here. 5. A few Halloween decorations! First, I'm pretty proud of myself for carving this owl (Of course! 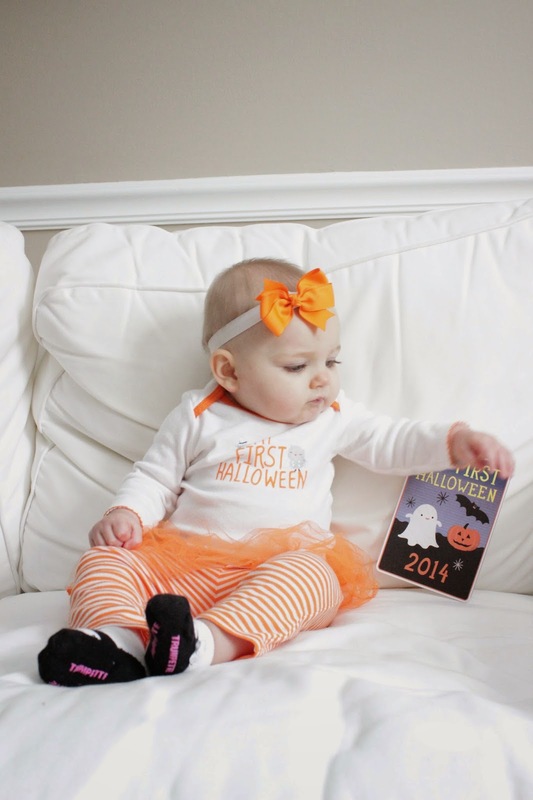 To match Ella's costume, duh!) pumpkin yesterday during nap time! I got a stencil from here, which made it super easy! For our other smaller pumpkins, I copied Carolina Charm and put fishnet stockings around them! Hers look way better though, surprise, surprise! I think for next year, I will use fishnets that are thicker/have bigger holes (if that makes any sense) because from far away, you can't tell that there is anything on my pumpkins! I do love that after Halloween, I can just take the fishnets off and use them as fall/Thanksgiving decor! 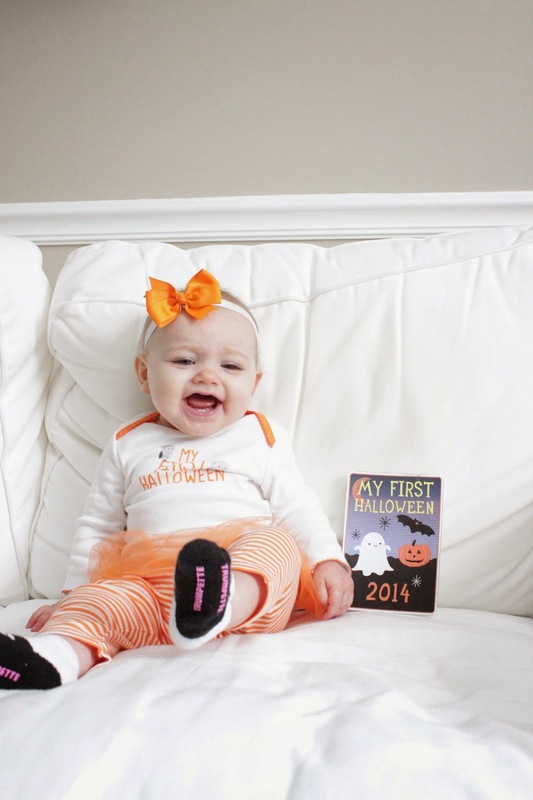 Have a happy, happy Halloween!!! Haha you are too much, super cute! These pictures are too cute! 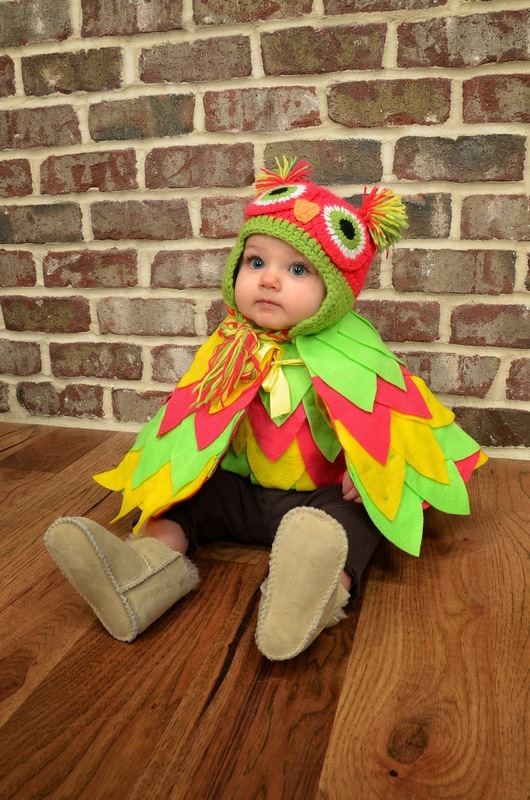 Especially Ella in the pumpkin & her little owl costume! 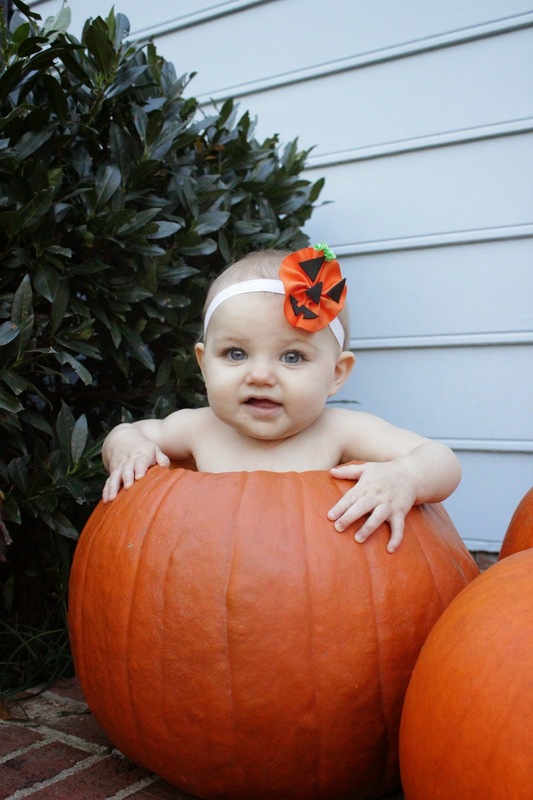 Okay, your sweet girl is PRECIOUS --- love the photos of her in the pumpkin and her owl costume is to die for! My sweet boy was an owl for his first Halloween and it was hands down my favorite costume to date! So glad you joined us for the linkup!!! You crack me up! so cute! Love the decorations and Ella is adorbs.